100% Custom Piece. Please contact us for further information and pricing. Dimensions (mm): 940 long x 550 wide x 760 high. Rosa is a very modern take on our current requirement regarding modern working surfaces. 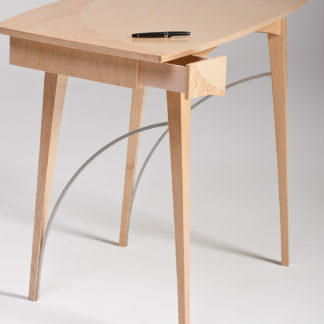 Large enough to easily facilitate a large laptop computer as well as a notepad or compendium, it represents the new, more discreet form of writing desk used in our current day and age. 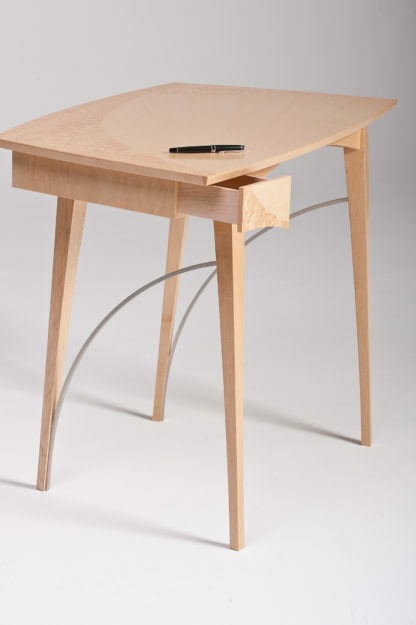 Beautifully hand crafted using solid timber, veneer and stainless steel features, the Rosa desk is worthy of that special area of your home where ‘something special’ yet very functional is required. It also has a small (long) drawer built in on one side only so as not to interfere with your leg room (which even has a secondary compartment right at the back of it to help conceal that special stash of chocolate etc that’s needed every now and again). 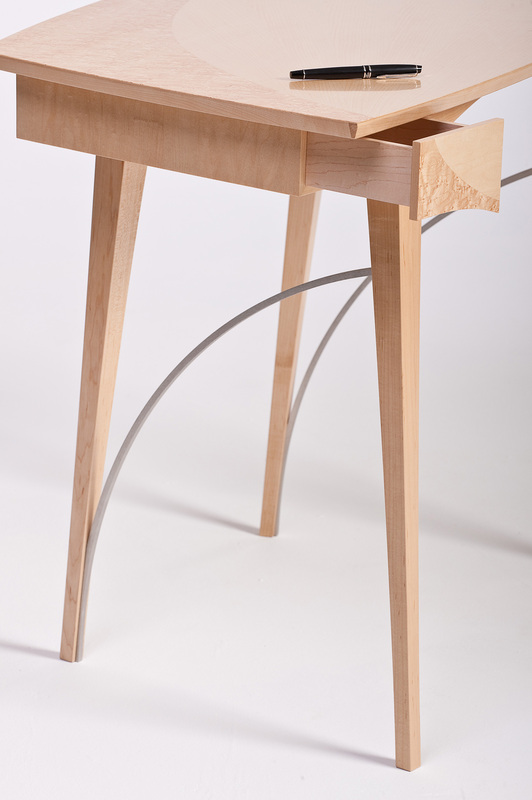 Rosa has also been carefully designed to allow the sitter to cross their legs whilst sitting at the desk without hitting their knees on anything underneath. 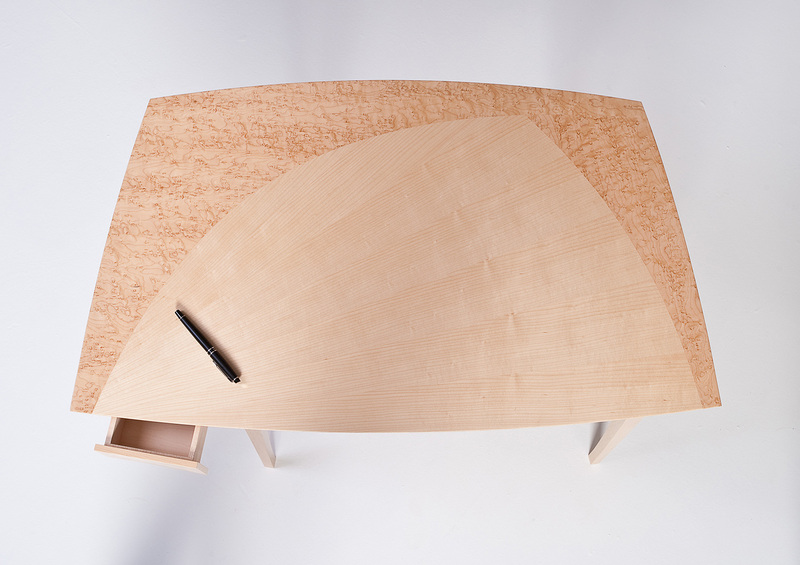 Hence the asymmetric nature of the drawer position and the minimalist design. Truly a well designed and very useful, smallish desk for today’s requirements. 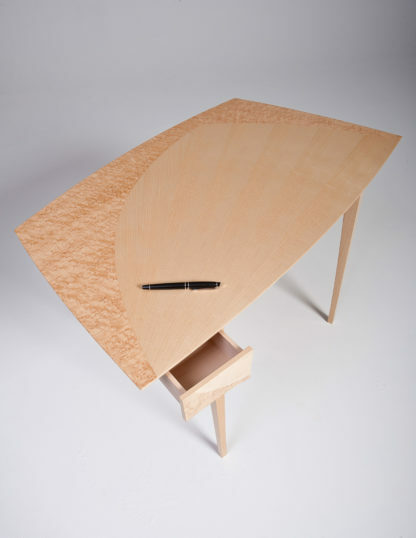 NB: The images shown are of a Rosa Writing Desk made using sugar maple, with bird’s eye maple veneer features and stainless steel. Other timbers can be utilised based on your preferences and requirements. Contact us for further details. We pride ourselves on our transparency and honesty, so we’d like to explain our delivery options in this same manner. Find out more about our delivery options. Lead time: Approximately 8-10 weeks. Sustainability is our essence, not just a tag line. Good Design is sustainable. 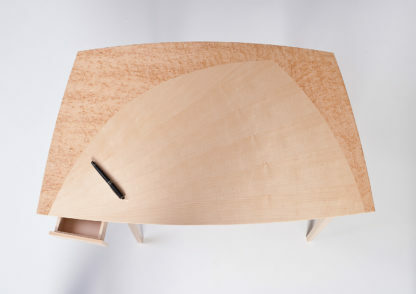 Minimal materials, cleverly put together, avoiding unnecessary production and waste. Well crafted designs that last a long time, because if you buy cheap you pay twice, and so does the environment. Sustainability is about health, avoiding bad chemicals, using non-toxic materials. Choice of materials is important. We prefer natural fibres in our fabrics. Wools, cottons, linens, and leather. Timber is a great choice for sustainable outcomes. Forests are good for our environment, and timber production has many eco-benefits. We prefer timbers that are properly harvested using sustainable forestry practices, and timbers that last. We use glass, or metal when that’s what the item needs to be beautiful, or functional, or to last a long time. That’s part of a sustainable outcome too. For further information, please refer to our design principles and our materials sections. Customisation available. Please contact us with your requirements. Keep up to date with all good things in design from furniture to buildings to life. 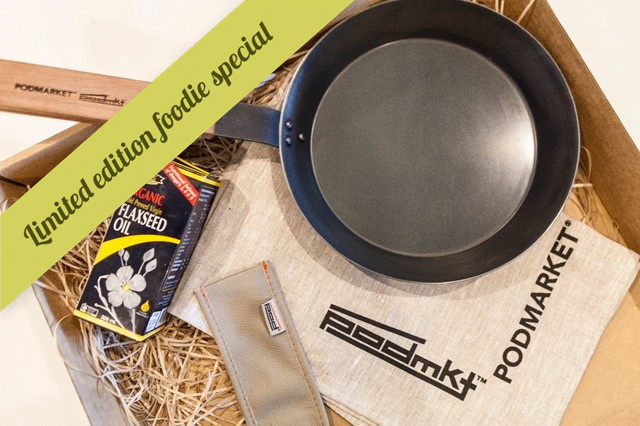 Join our VIP list to keep in touch for the latest on our upcoming PodMarket Christmas Frypan launch, and other good designs to come.